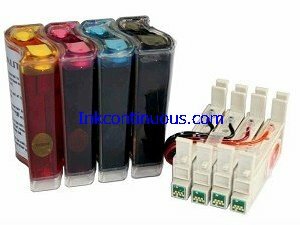 This continuous ink supply system is specially designed for Epson Stylus C88+, C88, CX3800, CX3810, CX4200, CX4800, CX5800, CX5800F and CX7800 inkjet printers. Auto reset chips are used, so you do not need to reset the chips manually. Cartridge #: T0601 Black ink cartridge, T0602 Cyan ink cartridge, T0603 Magenta ink cartridge, T0604 yellow ink cartridge. 12. 100% satisfaction guarantee Throw away costly replacement cartridges! Save money with the Continuous Ink System!